Society has trained people to believe that bigger is always better. 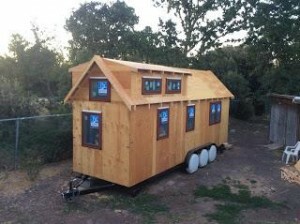 People enjoy large meals, big homes and huge televisions, so when they hear the concept of a tiny home, they often think it would be impossible to live in such as small dwelling. However, tiny homes might be just what they need to improve not only their own lives but also the environment by lowering their carbon footprint. There are many reasons why tiny homes are good for the environment. One is because they are considered net zero buildings, which are structures that consume less energy than the energy that renewable sources such as solar panels generate on the site. Since tiny homes use less energy, it’s easier to power them with renewable energy sources. They also require fewer materials to build, so less energy and natural resources are wasted during their construction. Additionally, tiny homes are easier to fully insulate, which further improves their carbon neutrality. The concept that tiny homes are sustainable goes hand in hand with the net zero aspect of the home. They are easier to heat and cool, and don’t have room for unnecessary electronics. As a result, many tiny homes can be run on just a few solar panels. In addition to using less power, they also use less water because they are equipped with smaller showers and water heaters. Many tiny homes can be outfitted with purification systems to collect rain water and filter it into usable, drinkable water. Tiny homes cost a lot less than traditional homes as well. Along with lower initial costs, they also require less land to sit on. Having less land means that homeowners have a smaller lawn to maintain. Additionally, maintaining a 300-square-foot home is a lot less expensive than maintaining a large 2,000-square-foot home. You may be surprise to learn how much money people spend on items that they don’t need. However, they are less likely to buy things they don’t have to have if they don’t have the room to store it. This allows them to minimize clutter and get back to figuring out what’s really important to them. If worst comes to worst, all of the money a tiny house saves you will more than cover the cost of purchasing additional storage. To read our full length article about tiny homes and the people who live in them, click here. For more information or a free quote on insulation, contact USI online to find a branch near you. USI believes that excellence in every step of the process and ensures timely completion and quality of service, time after time. House Ventilation Problems – How Many Air Leaks Does Your House Have? ← Is it time to replace your windows?